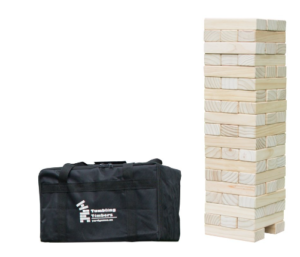 Giant Tumbling Timbers includes 56 – 1.5 x 2.5 pieces and 19 rows of tumbling timbers fun! This timber game stands 2.5 feet tall and depending on your level of experience can reach a height of 5 feet! This game is great to take outdoors. Perfect for group events, parties, camping and more. Tumbling Timbers can be played by 2 or more players. First, build the tower, then take turns to remove a block (using only one hand) and place on the top. The object is to be the last player to successfully stack a wooden block without knocking down the tower! This set is made with beautifully crafted undecorated solid pine wood and is hand cut and sanded for smooth game play. Please note that the bottom level only has two timbers to begin, using 56 timbers allows for the easiest packing arrangement. Our set comes with two extra blocks to add to the height and fun!56 Solid timbers measuring 7.5 x 2.5 x 1.5 inches (Two extra blocks to put on the bottom to add height!) See here for full game rules. Another solid Giant Jenga set. Comes with a transportation bag though it could be a little more tough. Besides that, this is a great choice for someone that doesn’t want to make thier own.